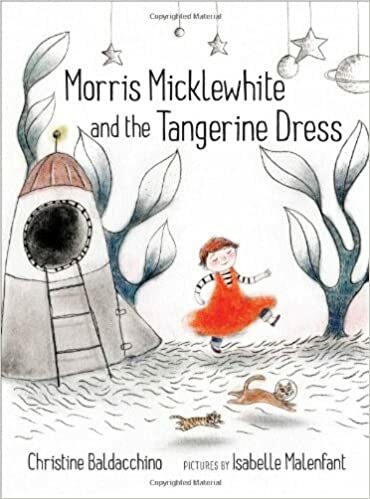 Morris Micklewhite and the Tangerine Dress (2014), thoughtfully written by Christine Baldacchino and warmly illustrated in deep swirling oranges by Isabelle Malenfant, is my favorite of the many books about gender creative children published since Cheryl Kilodavis’s 2009 My Princess Boy. In an interview with Slate, Baldacchino describes her inspiration for the story: while working as a pre-school teacher, one of Baldacchino’s boy students began to wear a dress from her classroom’s dress-up collection. When his mother discovered his dress-wearing habit, she was very upset, and the director of the school removed the dress from the classroom. Morris Micklewhite and the Tangerine Dress was Baldacchino’s way of sending a positive message to her student while keeping her job. The text opens with a close-up of the title character, Morris, and his mother, Moira, sitting at a breakfast table. Morris, Moira, and the family cat, Moo, all share gorgeous tangerine-colored hair along with their alliterative names. No other adult is present in the single-parent household, which represents non-nuclear family arrangements as positive and nurturing. Home is a safe, cozy space, and, at first, that atmosphere seems mirrored in Morris’s school. He plays with paints and puzzles, eats, and sings. But, the sense of security dissolves once Morris enters the dress-up center. In a two-page illustration that collapses fantasy and reality, Morris is revealed enveloped in a dreamy orange cloud of smoke emanating from a tiger. Although Morris is really wearing a rather ordinary tangerine dress, it “reminds him of tigers, the sun and his mother’s hair,” which is why Malenfant cleverly introduces dress-wearing Morris to the reader through an image that straddles the line between fantasy and reality. The dress is and isn’t a marker of femininity as the meaning of both terms, “dress” and “feminine”, shift when placed in a signifying chain with tigers and the sun. Dress-wearing causes conflict at school where Morris experiences waves of rejection: children point and laugh at him, chase him, and refuse to play with him. This makes him so sick he eventually ends up staying home from school. At home Morris cuddles up in bed with a book, Moo, and the now ever-present tangerine dress. Malenfant again creates images that blur the line between fantasy and reality. In one illustration, Morris’s bed is depicted outdoors and encircled by three large elephants. When we come back to reality Morris is joined in his bedroom by his mother. In his conflict free home, Morris begins to feel better, more confident, and comfortable. He will have to return to school the next day, but after taking a break from his peers’ ridicule and being surrounded by his mother’s love, he has sweet dreams of wild animals and outer space. The next morning, Morris paints a picture inspired by his dream. In his picture he is wearing a tangerine dress as he sits on top of an elephant. Morris brings his painting and the tangerine dress to school. The cycle of rejection begins again, but Morris is imbued with a new sense of confidence and self-understanding. He recognizes the choice he is making: wearing the dress may mean peer rejection, but he wants the dress more than superficial friendships. When his peers do, unsurprisingly, refuse to play with him, Morris plays by himself, building a space ship and placing his picture, depicting a collision of worlds — wild animals and other galaxies — on top of it. The picture intrigues his peers who ask him if there are really elephants and tigers in space; he invites them to find out and they follow him into his world. This is such a gorgeous book. I love the way Malenfant gives us access to Morris’s thoughts through dreamy illustrations, and Baldacchino’s commitment to her child protagonist and his desires. The theme of gender creativity is explored quite uniquely; it’s just this one dress that Morris desires, and for him the dress connotes the power of a tiger and warmth of the sun. I’ve read this with a three-year old who enjoys it immensely and “oohs and ahhs” his way through the illustrations, but I can see older children enjoying it to, especially if read with other stories about gender creative children, encouraging a conversation about the different relationships we have to gender and gendered objects.